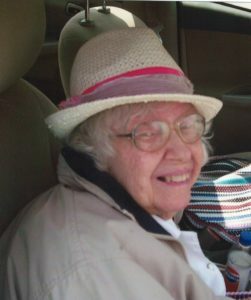 Anna Lee Teets, 87, of West Union, Ohio passed away on Saturday, April 6, 2019 at the Adams County Manor Nursing Home in West Union. She was born July 27, 1931 in Hillsboro, Ohio. She was preceded in death by her parents, Elmer Mercer and Letha Fern ( Gossett) Teets. Anna Lee is survived by her sister, Sara Lou Teets of West Union, and many cousins from other states. Anna Lee was a retired school teacher who taught for many years in Adams County. She received her degree in Home Economics from Wilmington College. She gave private piano lessons for many years. Anna Lee was a member of the West Union United Methodist Church, where she was an organist and Sunday School teacher for many years. Memorial donations may be made to the West Union United Methodist Church, P.O. Box 518, West Union, Ohio 45693, or to the charity of the donor’s choice. The visitation is from 11 am until 1 pm on Wednesday, April 10, 2019 at Lafferty Funeral Home in West Union. The funeral is at 1 pm with Pastor Al Bolte officiating. Burial will be at the West Union Cemetery in West Union. My thoughts and prayers are with you with the loss of Anna. May it give you comfort knowing she is in the loving arms of our Heavenly Father. In deepest sympathy. So sorry. Anna Lee was a sweet person. Sara Lou so sorry for your loss. Anna Lee would always have a smile and was so kind. That is how I will always remember her. Sara Lou - I am so sorry to hear of Anna Lee's passing. I have fond memories of you, Anna Lee and your family especially at the Methodist Church. My thoughts and prayers are with you. Sara Lou...I am so sorry to hear about Anna Lee. You ladies both hold a special place in my heart. I will be unable to be there for you on Wednesday as I will be working, but you will certainly be in my thoughts and prayers. Much love to you. Prayers for her sister, such a sweet loving woman. I was truly saddened to hear this news. My prayers and deepest sympathy to the family. She was one of my piano teachers. If it wasn't for her teaching me I don't think I would've ever been able to play.